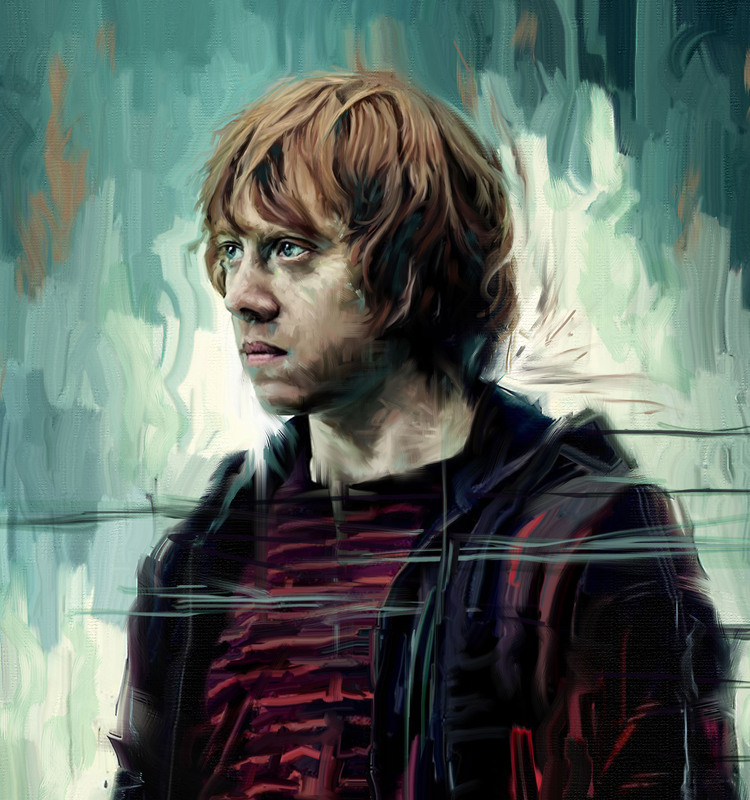 This is a series of digital portraits of actors and characters from the Harry Potter series of films. 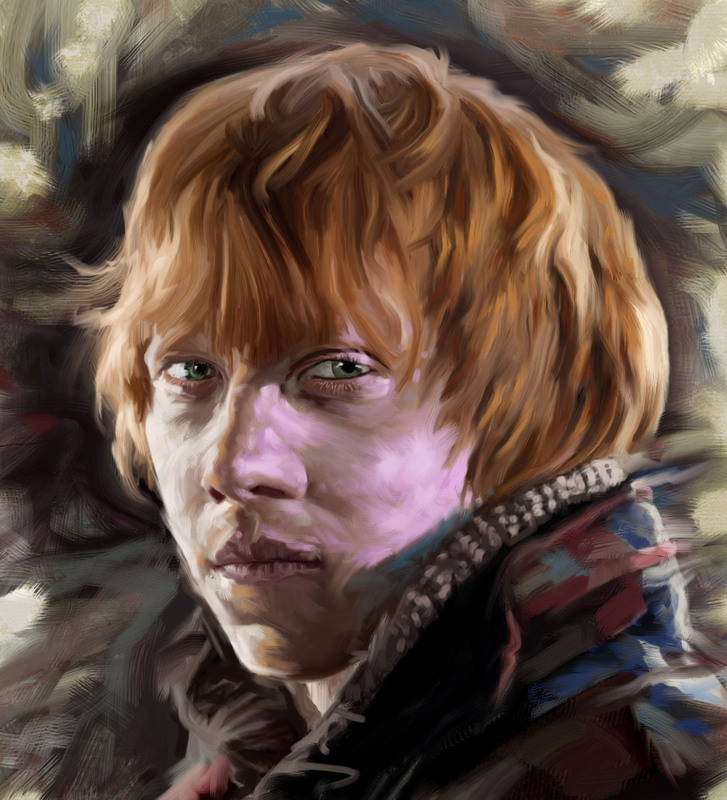 I am completing a set of digital portraits featuring characters from the Harry Potter movies. 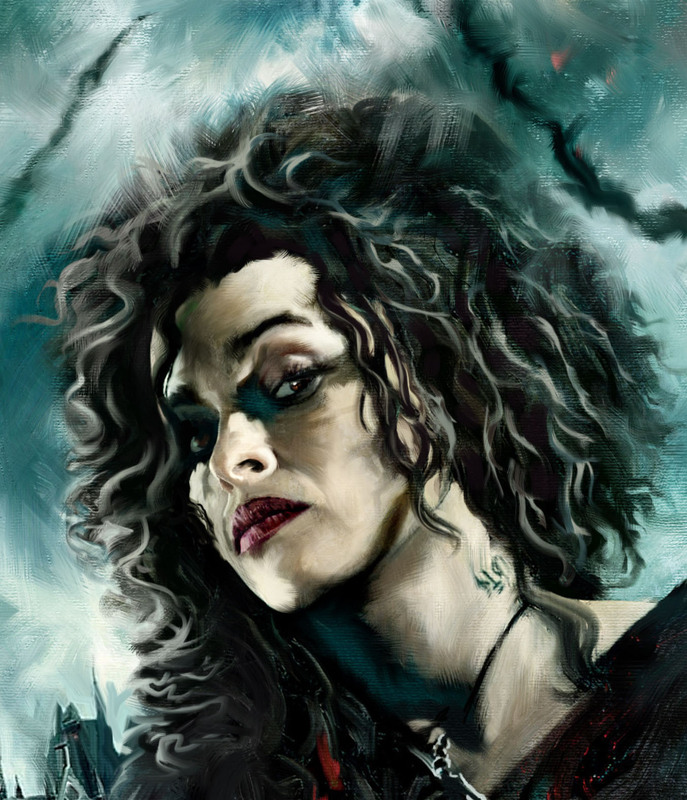 This set of illustrations began with black and white studies of 7 actors from the movies and has continued with several full color illustrations and portraits dervived from the characters in costume. The aim of the poject is to refine my painting skills and to inaugurate a new fresh style of image making that will allow me to create what is essentially fine art in the more linited context of illustration. 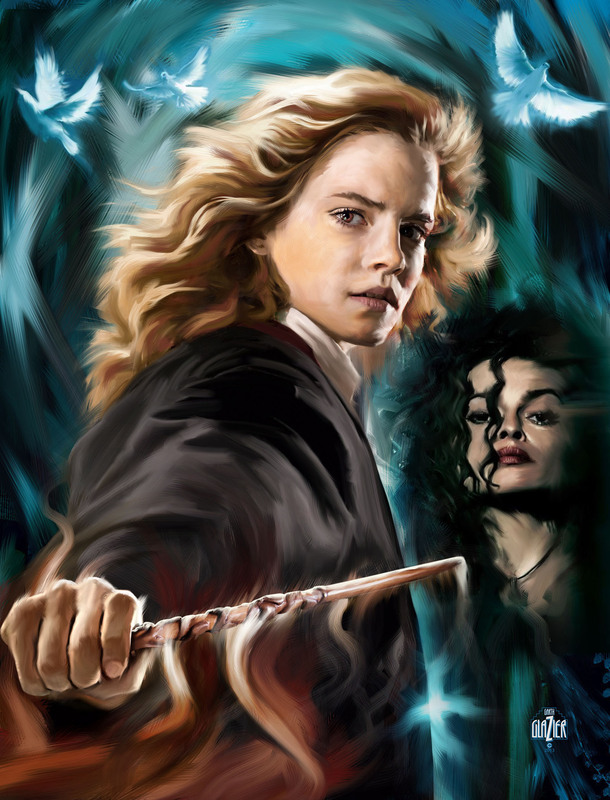 I am finishing up a set of paintings of the Harry Potter characters this month. They have made great subjects for practicing painting techniques. I have been studying the work of various portrait and landscape artists like Jeremy Mann and Jeremy Watts who have very energetic approaches to building color on the canvas. These fine artists are teaching me a lot about getting loose with brush strokes and maintaining an impressionistic attitude toward the subject. This painting took about 10 hours. 2 years ago if I attempted this it would have taken 20-30 hours and would not have been as strong as a painting. Starting loose and staying loose as long as possible is a big advantage in completing paintings more quickly. 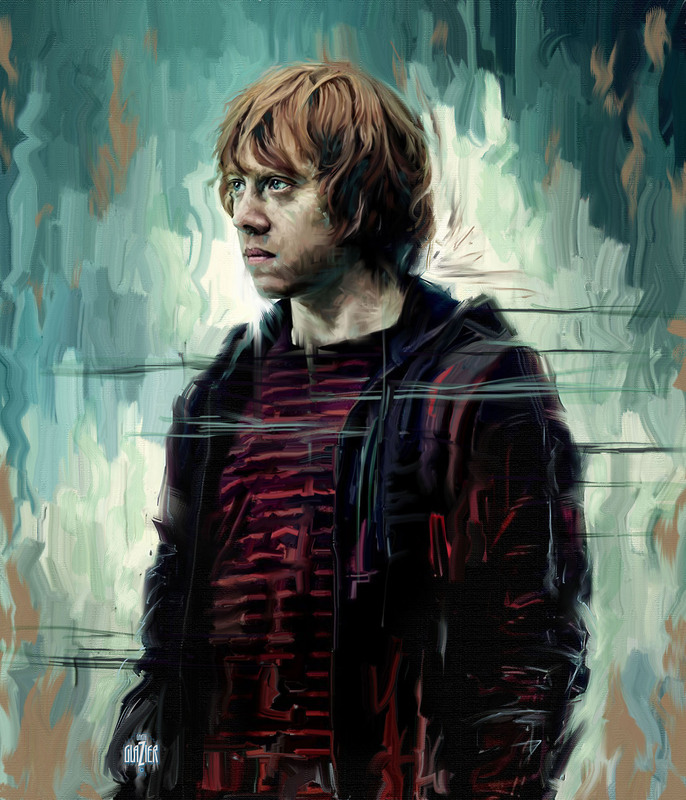 Another view of Rupert Grint as Ron Weasley. This painting features a rusted door texture and a burlap pattern imbedded into the background and modified with paint strokes to create a more authentic oil paint feeling. I was hunting for unusual photos of the Harry Potter characters that feature strange lighting or interesting expressions. 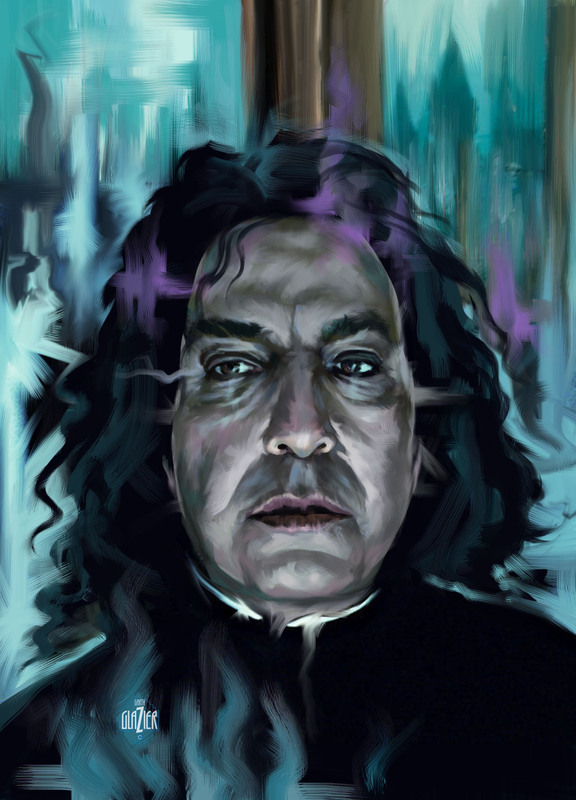 This painting emerged from a low resolution image with Snape in very low light. The hints of cool tones on his face were translated into a blue, green, lavender, and black palette of paint strokes. It took a while to bring him into focus, but I like the final result. The expression on his face and the colors seem to reflect the conflicted nature of his character. 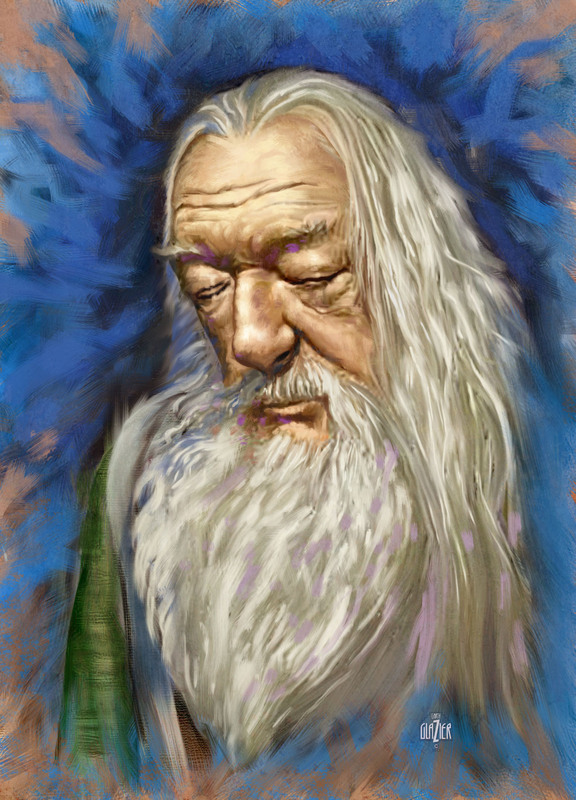 This is a completed portrait study of Professor Albus Dumbledore. In the image I based this painting on, he appears to be meditating. The photo was very small so I had to really get into the face with paint and work out the structure by guessing at some of the details. The actor Micheal Gambon has such an interesting face and this pose in make-up was hard to resist. He looks very medieval here. 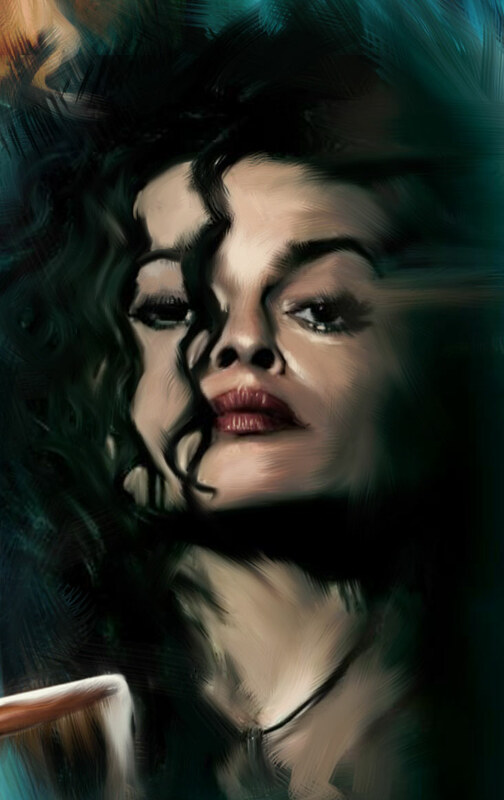 The portrait was created using Photoshop. 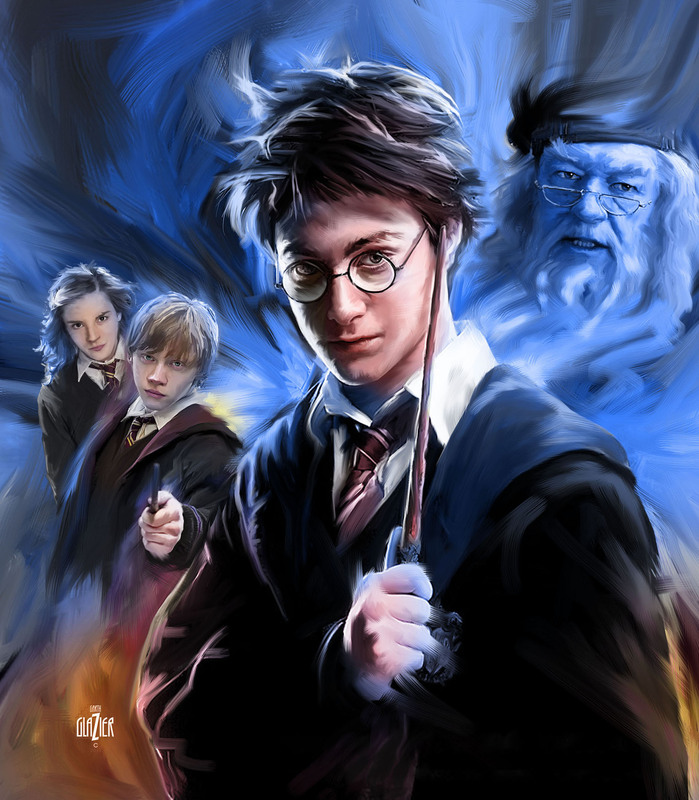 After much revising, I have finished another Harry Potter themed painting. 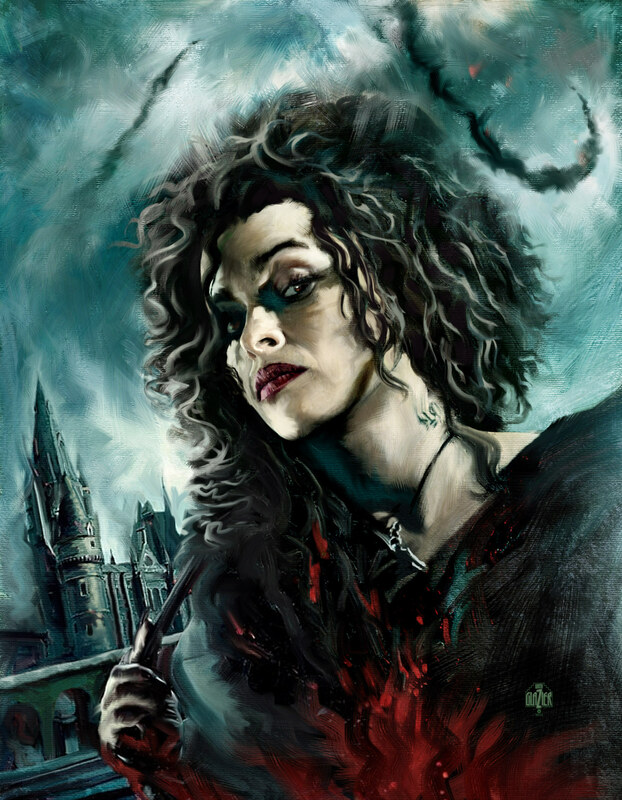 The subject is Bellatrix Lestrange. This time I shifted the style to a more textured approach and worked at creating a more authentic canvas look to the painted surface. The canvas texture is actually Conte Crayon paper with old weathered plaster and a bit of rust added into the mix. I wanted a darker feeling to this painting. It seemed fitting to alter the style a bit for one of the villains. Eventually, I plan to use these paintings as samples to show to publishers for possible book or game illustration commissions. It helps to show that you can re-create a style for a variety of subjects. In the mean time I am just having fun. Hermione's face was re-worked maybe 5 times before I was happy with the result. There are about 8 to 10 layers of paint here. The challenge was to keep the painting fresh and lively without making her look older or more angry. Louise thinks she looks "fierce," which is what I was after. I discovered a cool way to simulate the effect of glazing using layer settings in Photoshop. It really added depth to the shadow side of her face to layer red and green tints over the hair and some of the skin. I took a play out of the portrait painter's classical approach here and it worked. 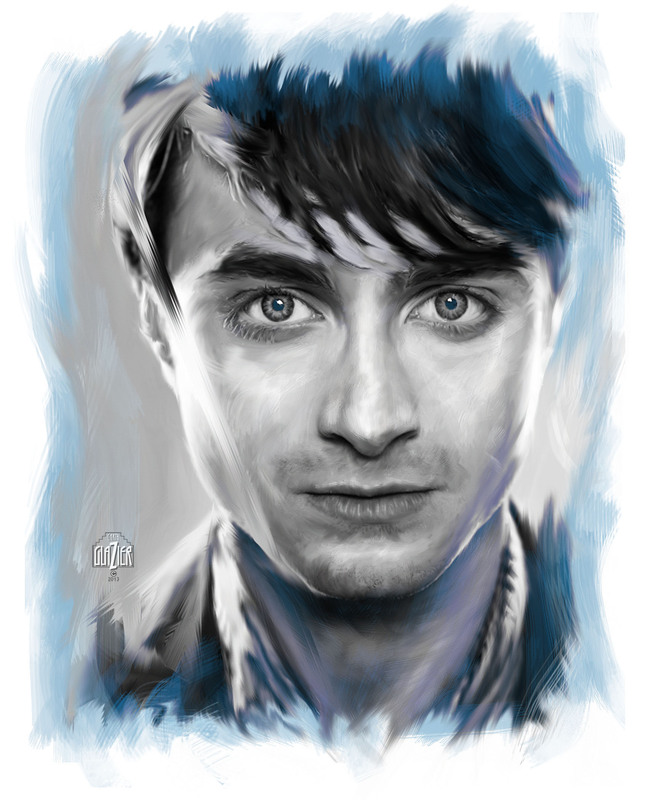 I finished up a larger Harry Potter montage featuring Daniel Radcliffe as the main figure. This one was fun to paint. I switched to full color after doing the black white studies and I think the practice in gray tones paid off. The look of this montage is meant to be painterly. After years of illustrating in more graphic or realistic styles I have been shifting to a looser more intuitive approach to my art. I plan to get more involved in portrait work both digital and traditional. Daniel Radcliffe has such a distinctive look. Even out of character as he is he, he still is immediately recognizable. 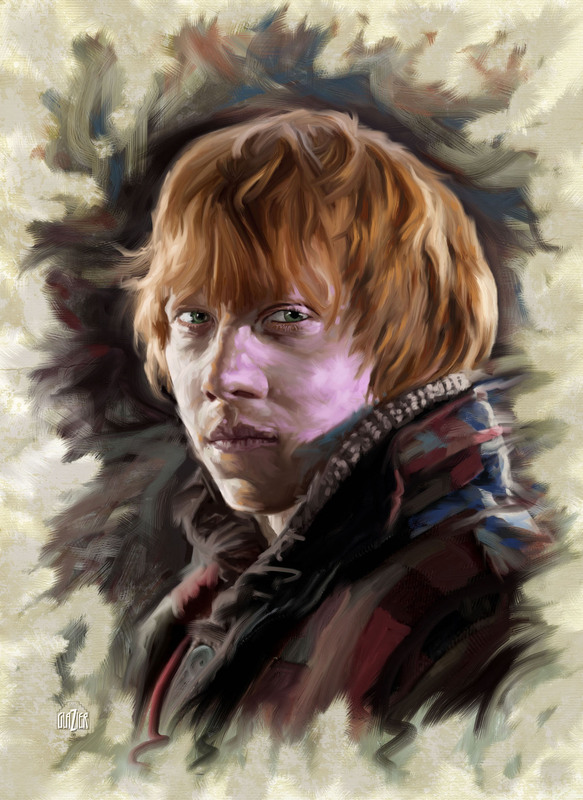 It was this portrait that started my recent series of Harry Potter studies of actors from the Harry Potter movies. I wanted to work in black and white for a while this summer, but I found that an added color was needed to make these subjects work. I treated them like hand tinted black and white photos that had been painted as portraits rather than photographed-if that makes any sense. These studies were inspired by a set of b+w images of the stars taken during the production of the final two films. All the studies were created as paintings in Photoshop using multiple layers of brushwork to build up a painted surface that is meant to suggest the look of traditional oil painting. 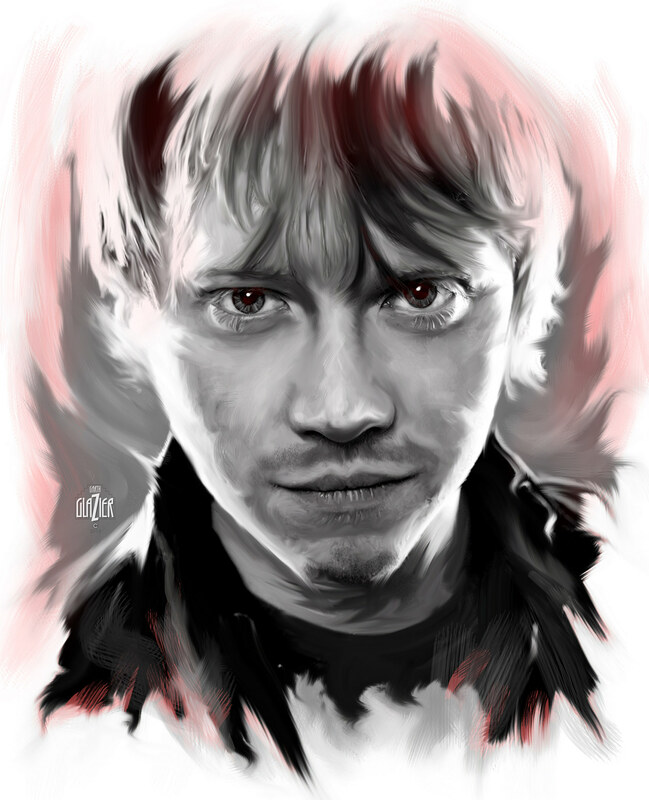 This study of Rupert Grint practically painted itself. I finished it in less than 3 hours and was happy with the result. It may be one of the strongest of the group of black and white portraits. Adding a tint of color created more depth and interest. The red was meant to suggest his hair color but also to echoe the passion in his expression. 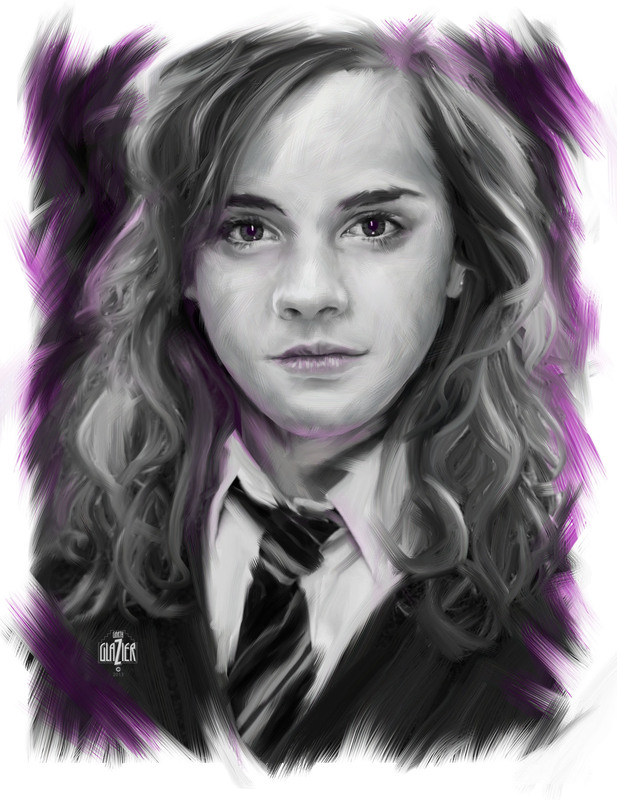 This portrait of Emma Watson took the longest of the set of six I have completed so far. I had trouble getting the eyes right for a while but was able to resolve the difficulties after taking a break and getting a fresh look at the painting the next day. She is easily the most photographed of all the stars, but I had to resort to a studio image as my source in order to make sure she looked as she did in her role as Hermione Granger. She has changed her look so many times since the last movie was released. 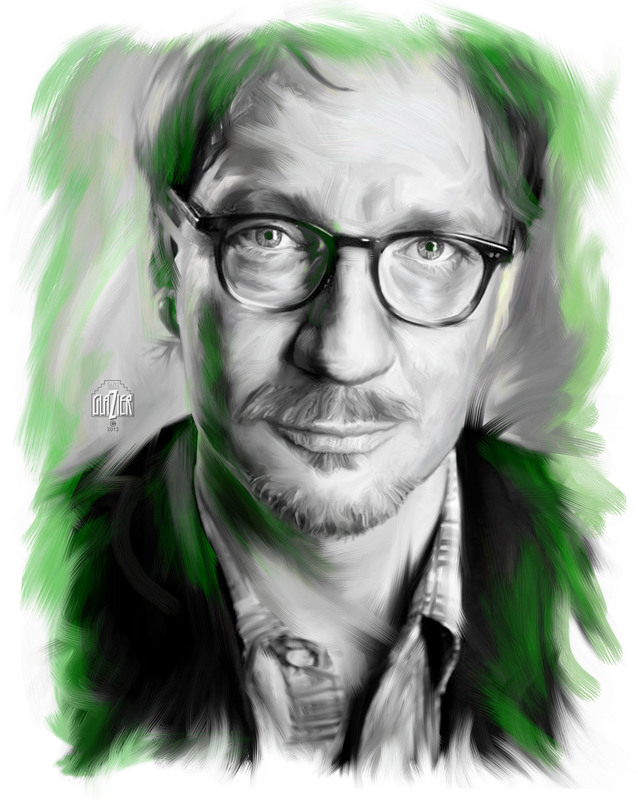 This portrait of David Thewlis was the hardest to resolve in terms of getting a clear likeness. Some people are simply hard to nail down in this respect. It may be due to his soft features. I had similar issues in getting a likeness of Johnny Depp. I think that good looking people do tend to be tougher subjects when it comes to creating an accurate portrait. Part of the problem is they often have few unusual features to grab on to when trying to get that last bit of accuracy in the finished art. 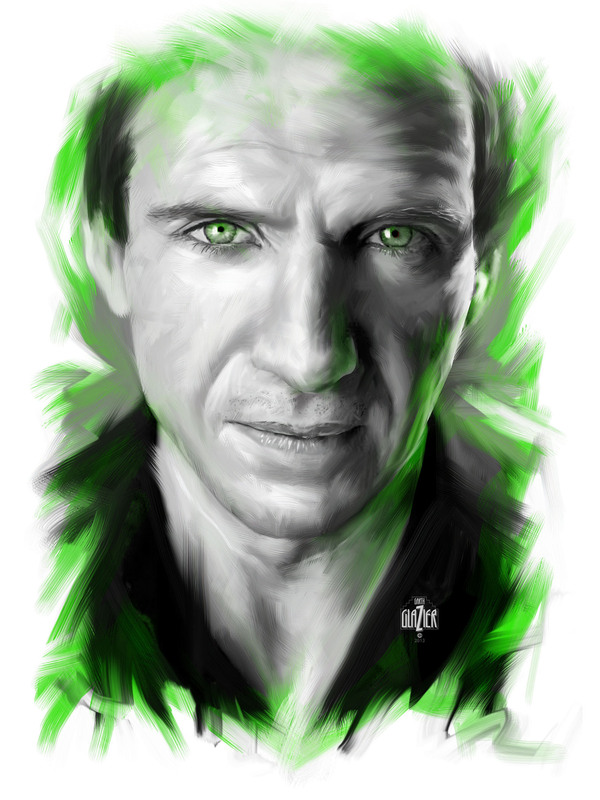 This portrait study of Ralph Fiennes was a test in getting a likeness. The smooth features made it difficult to nail down his distinctive look, but those eyes were the hardest. They have a very delicate curve with little in the way of distinctive structure in he brows to use for shadows. I have him out of character hereof coarse from his role as Lord Voldemort. Yes, he does have a nose which I rendered here. I did have to put a touch of green in his eyes to suggest the charactyer he plays. 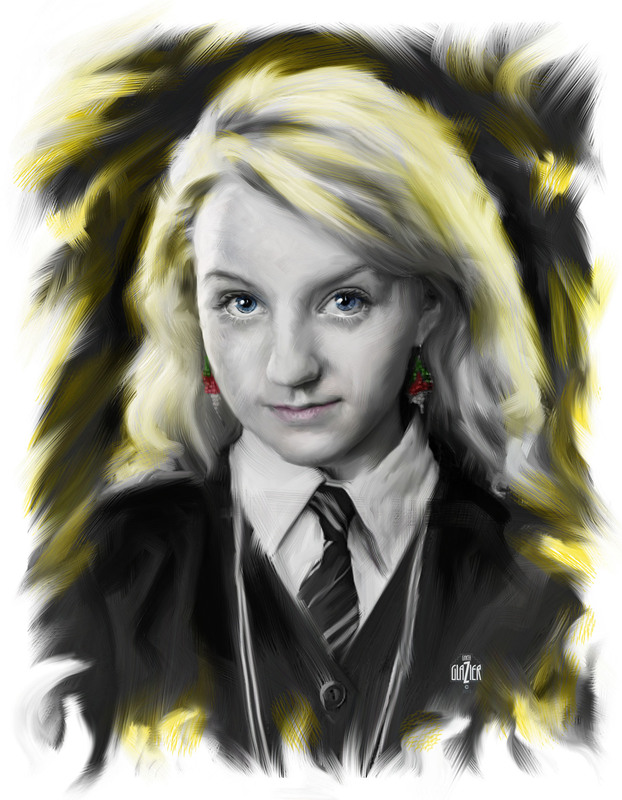 I was less sure of myself creating this portrait of Evanna Lynch as Luna Lovegood from the Harry Potter series. Her hair is a golden blond, so that became the color counterpoint to offset an otherwise black and white painting. The painting is softer than on the other portraits in this series. I did have to emphasize the radish earrings and those blue eyes to complete the likeness.